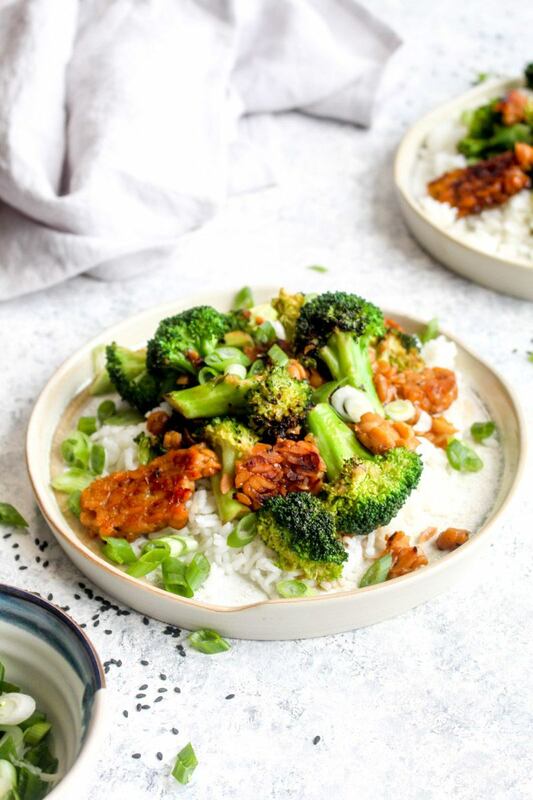 Tempeh Broccoli Stir Fry is a 30 minute meal that full of veggies and protein! Garlic Ginger Stir Fry Sauce brings this one pan recipe together. If you are serving the stir fry with rice, you can start cooking it now. That way it is done at the same time as the stir fry. Whisk together all of the sauce ingredients in bowl and set aside. Heat a large pan over medium heat. Add in the avocado oil and the tempeh. Sear the tempeh until it begins to brown on the first side, about 3-5 minutes. Flip the tempeh and repeat on the second side. Add in the sauce and the broccoli and cook until the sauce is absorbed and the broccoli is tender, about 7-10 minutes. Sprinkle in the scallions and serve over rice, if desired.